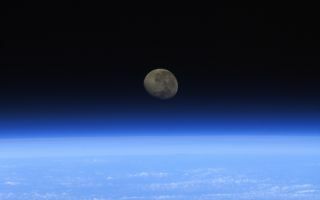 ESA astronaut snapped this view of moonset from the International Space Station as seen in this stunning space wallpaper. Parmitano is onboard the orbital outpost as part of ESA's long duration mission, Volare. ESA astronaut snapped this view of moonset from the International Space Station, as seen in this stunning space wallpaper. Parmitano is onboard the orbital outpost as part of ESA's long duration mission, Volare. This image was released June 26, 2013.